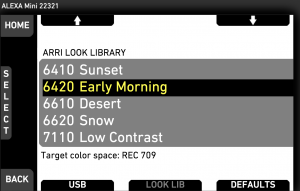 The ARRI Look Library offers on-set looks for all kinds of productions. It holds creative color gradings that provide a unique but repeatable aesthetic when combined with the cinematographer’s choice of lenses. Providing a repertoire of 87 high-quality looks in three intensities, the library allocates each of them in a unique number and groups them into nine themes, such as “Black-and-White”, “Film”, and “Period”. 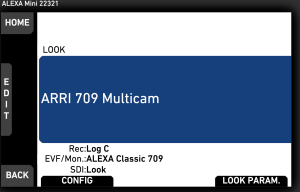 The ARRI Look Library is a licensed feature of the Software Update 5.0 (SUP 5) for ALEXA Mini and AMIRA Premium. 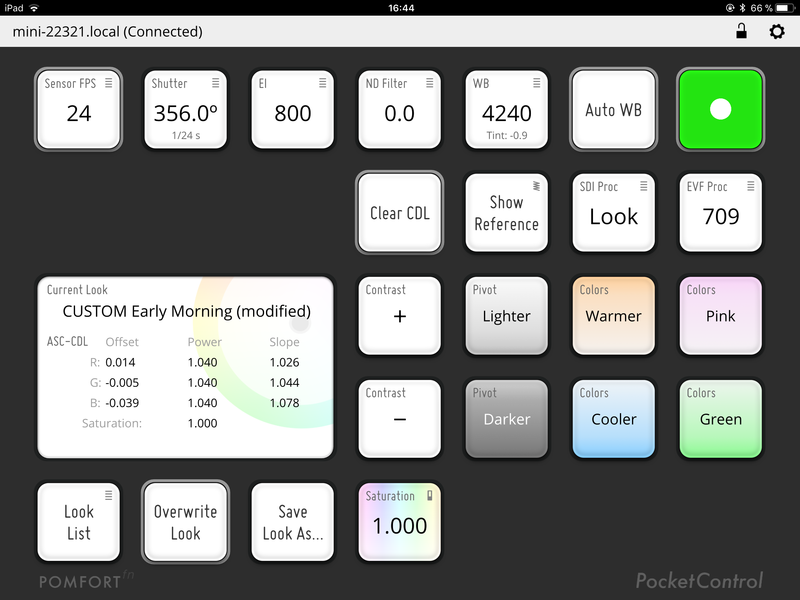 PocketControl allows you to directly work with the ARRI Look Library. 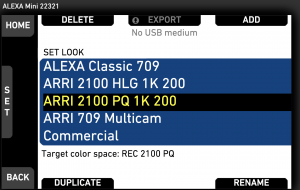 The app offers remote management functionality for the looks of the ARRI Look Library and allows to apply and refine them via your iOS device. 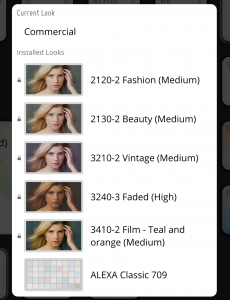 Each look is displayed with a preview image in the app. Then choose “ADD” at the top right. Then choose “LOOK LIB” from the bottom selection. Select the intended look and its intensity (Low (1), Medium (2), High(3)) to add it to the list of active looks. You can now go through the list and apply a look by tapping on it. 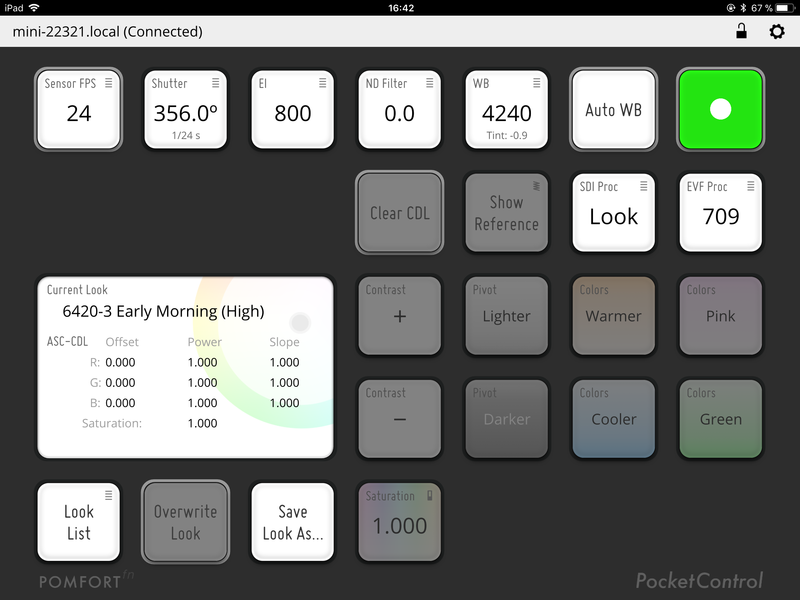 It will then be applied in the camera and displayed in the “Current Look” section in PocketControl. 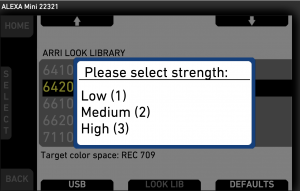 The looks from the ARRI Look Library are locked in the camera and cannot be modified directly. To enable refinement via CDL controls you first have to save the look as a custom look. The white balance is usually used to receive a neutral white on the camera image. As a mainly technical factor the white balance is set according for different lighting situations (as well as lens and filter choice). Its basic use case is to achieve a technically neutral image with a balanced white. After setting up the white balance with a neutral white, a creative look can be used to move the appearance of the image into a specific creative direction. As the image can be recorded without the look this approach enables a non destructive workflow and allows to test different looks on a well balanced neutral image. The warmer / cooler controls as well as the pink / green controls in PocketControl are implemented to preserve the overall luma of the image. They work as “lift” filters, which means that they affect mainly the darker and mid areas of the image and leave the highlights (almost) unaffected. In that way these controls also have a quite different impact on the image in their behavior than the implementation of white balance in the camera. Download PocketControl in the App Store now.